ALBUM REVIEW: “Powder Keg” by Riley Etheridge Jr. I tend to get weird looks from people in my circle when I mention I dig country music. “It all sounds the same” they say. “I don’t care about some guy and his pickup truck” they whine. 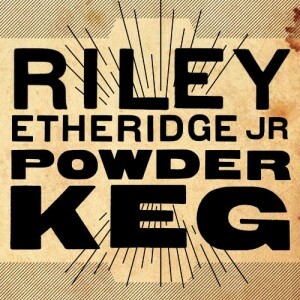 Well, next time I want to show someone how cool country can sound, I’ll spin up some Riley Etheridge Jr.’s latest, Powder Keg. Yes it’s country-esque, and even if you’re not a fan, I bet you’ll be into it. This Southern Carolina native’s sound isn’t just straight country. No, Riley Etheridge Jr. exhibits more of a blues/country fusion that just plain grooves. Horns, slide guitar, harmonica, it’s all present for aural pleasure. The sound is twangy at times, but just when ready to flip to the next track, a killer harmonica or fiddle solo busts out to keep you intrigued. Tracks like the title, “Powder Keg” or “Northeast Texas Women” will have you in a field with your buddies drinking PBR while you shoot at rocks with a BB gun (why yes I did grow up in the country, why do you ask? ), whereas tracks like “Scene of the Crime” or “54 Cadillac” really play up the blues. Whatever you’re into, I implore you to give Riley Etheridge Jr.’s Powder Keg a listen. You’ll probably find something you like that you never knew you did.